NEW YORK — Evangelization, mercy, encounter and accompaniment are the hallmarks of the first four years of Pope Francis’ papacy, Archbishop Christophe Pierre, apostolic nuncio to the United States, said March 15. “First and foremost, Pope Francis is committed to the work of evangelization. The main role of the church is to evangelize, to receive the gospel and offer it to the world,” he said in a conversation in New York with Jesuit Father Matthew F. Malone, president and editor-in-chief of America Media. “The raison d’etre of the church is evangelization. It’s not a business, it’s not an organization or an association for the defense of Jesus, but a group called to announce God’s presence to humanity,” Archbishop Pierre said. At a meeting of cardinals before the conclave that elected him pope, then-Cardinal Jorge Mario Bergoglio reflected on the challenges Pope Benedict’s successor should address. Archbishop Pierre said Pope Francis’ handwritten notes from his talk were a blueprint for his papacy. “The church is a continuation of Christ in the world,” Archbishop Pierre said. And the pope continues to insist it is time not to rest, but to go to the many peripheries to be God’s presence to the people who suffer, he said. Father Malone said Jesus, the source of joy in the Gospels, is the medication in the field hospital. Pope Francis pictures himself as a patient in the hospital, not the doctor, he said. 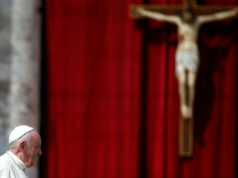 People have rediscovered the sacrament of penance during this papacy because Pope Francis identifies himself as a sinner and is seen going to confession, Archbishop Pierre said. “Many had abandoned the sacrament of reconciliation, but have rediscovered the necessity of receiving the forgiveness of God and giving it to others,” he said. When the pope speaks of mercy, it is not only a human virtue, but a gift from God, and people are the first target of God’s mercy, Archbishop Pierre said. “Our church is a merciful church. We present truth in a respectful way. Mercy means dialogue and walking along the path of the other,” he said. He recounted the pope’s visit to Sweden to mark the 500th anniversary of Lutheranism. “We’ve had the idea that Luther is the enemy,” the nuncio said. But Pope Francis had an encounter with Lutheran leaders there and said Luther is part of the history of the Catholic Church. The pope speaks with his actions, Archbishop Pierre said. The nuncio said Pope Francis approaches dialogue as an important ingredient of public life. People who dialogue successfully must be rooted in their own convictions and faith. In this way, dialogue is “two rooted persons looking for the truth,” he said. The pope is hard on bishops and priests because he wants them to be masters of discernment and help people develop the capacity to choose between good and bad, Archbishop Pierre said. It is not enough to identify right from wrong, he said. If the understanding is not applied to personal actions, life will be a dichotomy. Archbishop Pierre said Pope Francis’ apostolic exhortation “Evangelii Gaudium” (“The Joy of the Gospel”) is based on the closing document of the 2007 meeting of the Latin American bishops’ council in Aparecida, Brazil. Then-Archbishop Bergoglio led the editing committee for the document. A document intended for the Latin American bishops “became the patrimony of the whole church,” Archbishop Pierre said. He said Pope Francis’ experience living in a “peripheral” country helped him elaborate a different kind of option for the poor than the one envisioned three decades earlier at the Medellin, Colombia, meeting of the Latin American bishops. “The reality is the people had been evangelized so deeply that the culture was filled with the Gospel,” he said. Because the church does not play the same role in people’s lives it once did, the church today is challenged to help people encounter Christ and rediscover the presence of God in their own lives. It must be missionary and not self-referential, the nuncio said. Archbishop Pierre entered the papal diplomatic corps in 1977 and served in New Zealand, Mozambique, Zimbabwe, Cuba, Brazil, Geneva, Haiti, Uganda and Mexico. Pope Francis named him apostolic nuncio to the United States April 12, 2016. The event was co-sponsored by America Media and the American Bible Society and held at the New York Athletic Club.